SuperSonics being trounced by the Denver Nuggets. Weekend America host John Moe has always been a fan of the Seattle Supersonics basketball team. But this year, his team moved away and changed their name. So now John is a free agent. Free to sign as a fan with any team in the league. One of the worst things about the Supersonics' demise was that thousands of Sonics fans were completely powerless in the transaction. But maybe, just maybe, this fan can empower himself and turn the tables on the NBA. A couple of weeks ago I found myself in a gym in downtown Minneapolis watching tall sweaty men play basketball. I was looking for love. All my life, I have cheered for one pro basketball team: The Seattle SuperSonics. Do you know the starting lineup of the Sonics' 1979 championship team? Gus Williams, Dennis Johnson, John Johnson, Lonnie Shelton, Jack Sikma. I've followed a lot of bad Sonics teams too. That's part of the deal. No divorce. For better or for worse. Until death do us part. And the Sonics have died. A few months ago they moved to Oklahoma City, becoming the Oklahoma City Thunder. That name feels like hair on my tongue. My basketball spouse is dead. So I'm free to remarry. You know what? Let's drop this whole love, marriage, death analogy. It's kind of creepy. How about this: I am now a fan free agent. I contacted teams all over the league to see if they wanted to sign me as a fan now that I was on the open market. An overwhelming number of them did not respond. But some did! The Minnesota Timberwolves were the tall sweaty guys I mentioned earlier. I sat down with assistant general manager Fred Hoiberg after a recent practice. "We're one of two teams that brings back three 40 percent three-point shooters from a year ago, the other being the Lakers. Ryan Gomes, capable shooter. Kevin Love has such a unique skill set - to get Al Jefferson the ball. He's another guy who can shoot the NBA three," he said. I loved talking hoops with Hoiberg. Stats, schemes, he's got a great basketball mind. But I guess I was looking for heart. Where would the Timberwolves take me? "Well, I think we'll improve this year, absolutely," Hoiberg said. "Randy Foye missed the first 44 games last year with a knee injury. When he played that last month once he got his timing back, our last games we played at almost .500 ball." So was he welcoming me aboard then? "I am absolutely welcoming you into our franchise. We could use some fans right now. You're part of the blueprint. Absolutely." I thanked him for the offer but told him I had other teams to talk to. The Phoenix Suns offered Rick Welts. Rick's their president and chief operating officer and he's been in the league a long time. He was the media relations guy for the Sonics in that 1979 championship year. Knowing I was a reporter, Rick made sure to push the storylines and characters of the team. I asked why I should be a fan. "I find it a lot harder to come up with reasons why you wouldn't. I would just say Shaquille O'Neal, the quote machine, anchors our center spot, so there's never a dull moment when Shaq's in the house," he said. "Then I would say we got the rookie with the best hair in the league in Robin Lopez, who looks like he stuck his finger in an electrical outlet. And the Phoenix Gorilla, who is a mainstay and has been for almost the entire history of our franchise, so we're not lacking for entertainment value off the court either." The gorilla dunks, by the way. And it's a guy in a gorilla suit, I should clarify. So Phoenix was all about fun. I like fun but then I wanted more of the hard basketball data Minnesota offered. Neither team felt completely right. I had to keep looking. The Milwaukee Bucks put starting center Andrew Bogut on the line. He's an Australian. I asked him why be a Bucks fan? "Why? First of all we got an Australian playing for Milwaukee Bucks. That's the best reason - multicultural theme. We also got a prince from Africa. If you ever want to go to Africa and be looked after, we got your back there as well. Luc Mbah A Moute is a prince of his village in Cameroon so if you ever head to Cameroon you can get the five star treatment," said Bogut. "I can just flash some Bucks gear?" I asked. "Oh you'll be good, yeah. Probably get a crown," he said. Hmm. I do like crowns. Seriously, the Bucks are on the rise, Milwaukee is great - I enjoy beer. And their star player directly asked me to be a fan. And he made jokes! You'd think I'd declare my allegiance right there. But I couldn't. I had one more team to talk to. The Memphis Grizzlies. General Manager Chris Wallace spoke from the team bus between games in Oakland and Sacramento. "I used to work in politics and you gotta grab people by the heart, grab their emotions first and their head will follow," he said. Wallace said even though the team is bad at the moment, I should become a fan now so that when they get good later, I'll have been part of a movement of believers. He drew on his political background with an approach straight out of the "Yes We Can" playbook, saying "everybody wants to be ahead of their time. I mean, how would it have felt to be the first guy on your block to recognize Barack Obama a couple years ago as the next President of the United States?" Wallace was clever to bring up the Grizzlies' future to me of all people. The team is losing money in Memphis and could eventually be sold and moved to Seattle. The Sonics team name is even available for some future team there. They could be my beloved, resurrected at last. But then Memphis would be heart-broken. How could I root for that to happen to them? You know what? The love and marriage analogy was the right one after all. I'm in mourning. And these other teams, well they're all super nice and I had a great time talking to them. But it's too soon. I just want to be friends right at the moment. Like Facebook friends. I'm going to hold on to the Timberwolves number, though, and here's why: When I was at that practice, Mike Miller, a guard on the team, was shooting free throws. Occasionally the ball would carom off and bounce over to me. I picked it up and threw it back to him. And each time I did, Miller said, "Thank you." Thank you. Pro basketball is a business and a passion and kind of a mess. But if there is some humanity in there somewhere, I can be a fan of that. As a Timberwolves fan anytime someone willing joins our downtrodden fan base it is welcome. 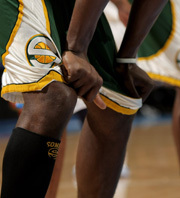 Of course we haven't lost our team so we don't know pain like Sonics fans. If you do change your mind after our teams sorry start, I won't take it personally either. Came across the article on TrueHoop. Being a Grizzlies fan, I was obviously hoping to welcome you into the dwindling fanbase, but I must commend you for your choice if just for the reasoning. Mike Miller is a class act, and we were sad to lose him. I know all about this, have read all kinds of reactions to the Sonics demise, and written a few. Just so you know John, I'm following the fixing up the car, uh Key Arena, for the return of a team we are going to call the Sonics. Hang in there, don't do what Sharmsn Alexie did and we for the Portland TrailBlazers.